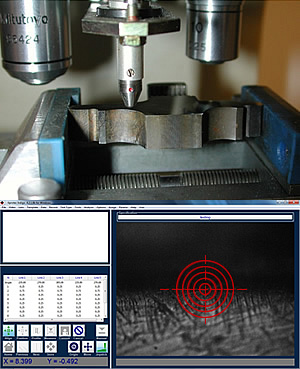 Indent Measurement "One Click Away"
In today’s demanding environment where quality assurance is an everyday requirement Aprotec have sought to find present day retrofit solutions that compliment fully functional older machinery. Digivision Lite and Indigo utilise Windows 7 based image analysis software to eradicate the need to peer down a microscope and ameliorate the existing labour intensive systems. Digivision Lite has been developed to replace the original Vickers microscope and eyepiece or the Dynascope system fitted to existing Vickers pedestal machines. 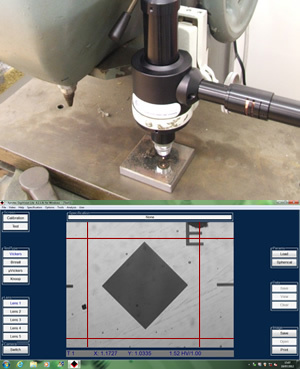 Indigo has been developed as a direct replacement for the Windows 98 based In2View system most commonly fitted to Mitutoyo hardness testing machines. Automatically traverses a pre-programmed sample to obtain case hardening results and graphical representation.